Robert Hayden Awarded NSF Grant "(Re)Constructing Religioscapes as Competing Territorial Claims in Post-War Bosnia & Herzegovina"
Brief Abstract: The Bosnian war (1992-95) was a conflict between three religio-national heritage communities within the country: Bosniaks (Muslims), Serbs (Orthodox Christians) and Croats (Roman Catholics). The widespread targeting of religious buildings there is a major case study in the destruction of cultural heritage as both war crime and violation of international humanitarian law. Less known, and unstudied, is that as of 2018, there are more religious buildings in Bosnia than there were before 1992, many built not to serve the needs of local communities but rather to assert claims to territories, marking dominance by the community now holding that place, or varying claims of still belonging there by communities expelled during the war. This project studies the use of specific structural forms and spatial positionings of (re)building religious structures as indicators of present dominance and potential challenges to it, in a country that is post-war but not post-conflictual. 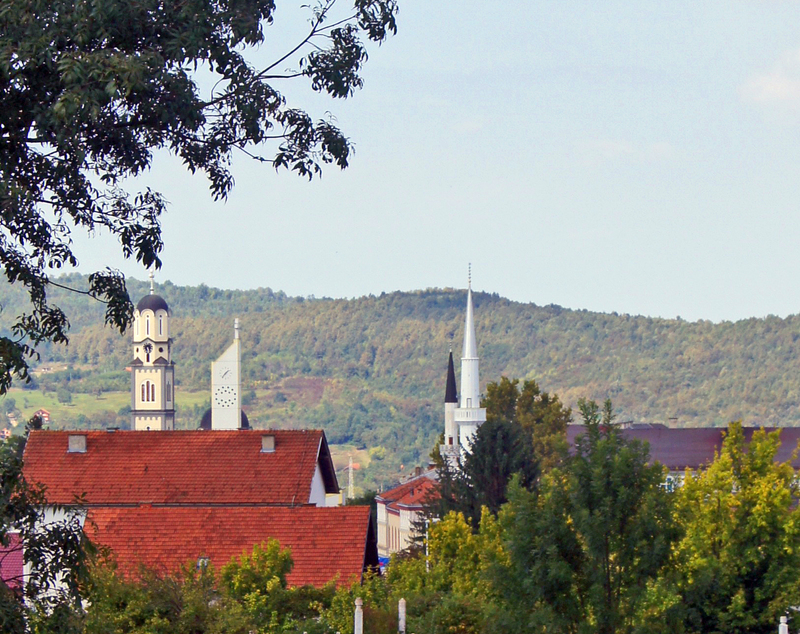 Image: Derventa, Republika Srpska, Bosnia & Herzegovina, September 10, 2018: Serbian Orthodox church (left), Roman Catholic church (center), and two Muslim mosques (right), in center of town. The war reduced the Croat population from 39% to 9% and Muslims from 13% to 7% but increased Serbs from 41% to 82%. The superior height of the Serbian Orthodox church is matched by a minaret on a mosque; but the mosque is otherwise much smaller than that church and the Roman Catholic church is lowest and smallest of all. Though the country is nominally secular, the central square on which all three religious buildings are located is named the “Plaza of Orthodox Christianity".